A social life cycle assessment (S-LCA) is a method that can be used to assess the social and sociological aspects of products, their actual and potential positive as well as negative impacts along the life cycle. This looks at the extraction and processing of raw materials, manufacturing, distribution, use, reuse, maintenance, recycling and final disposal. S-LCA makes use of generic and site-specific data, can be quantitative, semi-quantitative or qualitative, and complements the environmental LCA and LCC. It can either be applied on its own or in combination with the other techniques. S-LCA does not provide information on the question of whether a product should be produced or not – although information obtained from an S-LCA may offer “food for thought” and can be helpful for taking a decision. Although S-LCA follows the ISO 14040 framework, some aspects differ, are more common or are amplified at each phase of the study. The UNEP Guidelines for Social Life Cycle Assessment of Products proposes a methodology to develop life cycle inventories. A life cycle inventory is elaborated for indicators (e.g. 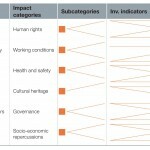 number of jobs created) linked to impact categories (e.g. local employment) which are related to five main stakeholder groups (e.g., [i] worker, [ii] consumer, [iii] local community, [iv] society and [v] value chain actors).